In these latest mentions to have come through my inbox, do note the logo. The large "A" at the bottom refers to Monsanto's Acrilan acrylic fiber. These two women in the image on the left appeared in a 1968 advertisement. 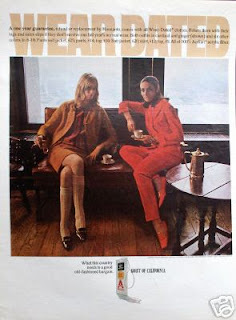 You'll love this site with page 16 from the 1971 Sears Catalog: Ladieswear... Be sure to check out each image and read the captions. Note the third image of two women wearing Acrilan acrylic fiber knit dresses; the Wear-Dated logo barely peaks through at the bottom. Do you recognize the model on the left? 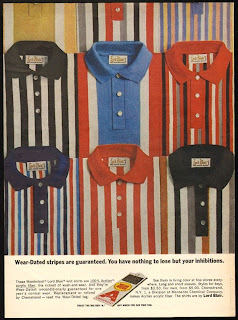 "Wear-Dated stripes are guaranteed. You have nothing to lose but your inhibitions. These Wonderknit Lord Blair knit shirts are 100% Acrilan acrylic fiber, the richest of wash-and-wear. And they're Wear-Dated: unconditionally guaranteed for one year's normal wear. Replacement or refund by Chemstrand - read the Wear-Dated tag. See them in living color at fine stores everywhere. Long and short sleeves. Styles for boys, from $3.50. For men, from $5.00. Chemstrand, N.Y. 1, a Division of Monsanto Chemical Company, makes Acrilan acrylic fiber. The shirts are by Lord Blair. Trust the Big Red "A." Buy when you see this tag." 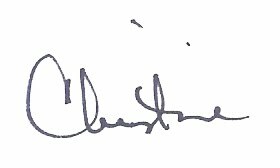 In this next image, note that the Wear-Dated logo features a "C" [I assume for Chemstrand] rather than the "A" featured above. 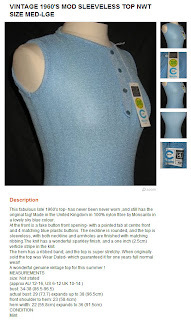 I came across this listing in January 2010, this time on Etsy where the garment is still available for purchase. Here is a link to the full listing: VINTAGE 1960'S MOD SLEEVELESS TOP NWT SIZE by sewingmachinegirl. "When originally sold the top was Wear Dated- which guaranteed it for one years full normal wear! A wonderful genuine vintage top for this summer ! ..." It is made of nylon fiber. Per the description, they were aired on a local Los Angeles station KCOP-TV in February 1992. Uploaded by VSNHeats. - Classic TV and last night's shows, online. That's it for now. I'm all caught up on my Wear-Dated brand historic mentions. PS: For more on this subject, check out Signs Of Another Brand Trail: Wear Dated, Wear-Dated Brand Evolution and Creation Stories. 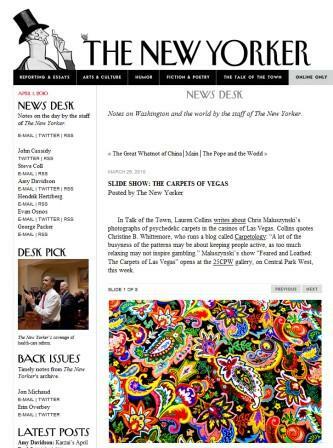 Have you checked out The New Yorker, and specifically The Talk of The Town? You're in for a treat because the 4/5/10 issue titled At The Casino FLOORSCAPES by Lauren Collins discusses carpet and more specifically 'psychedelic' Casino carpet as interpreted by New York-based photographer named Chris Maluszynski. In addition to the article, there's a companion Slide Show: The Carpets of Vegas published on March 29, 2010 which offers a glimpse of 8 bold, kaleidescopic patterned casino carpet floorscapes. I suggest you look through them first then return to Lauren's article. I spoke with Lauren Collins on March 22nd. She had noticed several stories covered here in the Carpetology Blog about casino carpet and wanted to further discuss big, bold and busy carpet patterns to put into perspective Maluszynski’s show “Feared and Loathed: The Carpets of Las Vegas” which opened April 1st, 2010, at the 25CPW gallery, on Central Park West in NYC. Thanks to the annual Surfaces show, I've seen my fair share of casino carpet in Las Vegas. What's more is that I toured the Wynn and the Encore this past February and was able to share some of those insights with Lauren. The carpet photo you see in Carpet Style Trends 2010 is from our starting point for the tour in the Wynn. Its sister in the neighboring Encore featured the same red background but with butterflies. Can you think of other categories? In her article, Collins mentions David G. Schwartz, the director of the Center for Gaming Research, who has posted on his blog the die is cast pictures and an essay on Casino Carpet: The Quest & Conundrum. Definitely check those links out. Thanks, Lauren, for a really fun conversation and for the opportunity to contribute to your article. I wonder if I should relaunch A Foot's Perspective with a Casino Carpet angle?